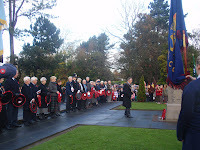 The laying of wreaths at the Ponteland Memorial on remembrance Sunday was well attended. The Memorial was erected after the 1914-1918 war to commemorate the dead in a war supposed to be the war to end all wars! More names were added for the 1939-1945 war. Today we are saddened by the loss of yet more young men and women who are fighting on behalf of their country in Afghanistan. The men, women and children of Ponteland stood together in the damp grayness of a November morning to remember and appreciate the sacrifice of many.